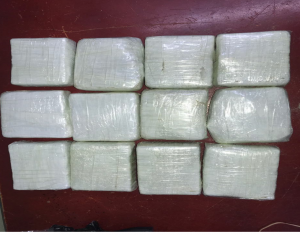 CANU said on July 2, 2018 at 11 O’clock Monday night the men, including, shipper Navindra Sarwan, were arrested in relation to suspected cocaine found under the vehicle of the said shipper while the vehicle was parked inside the compound of the CAMEX Bond CJIA Timheri. The suspected cocaine weighed over 7kgs. Meanwhie, a woman named Natasha Blair who was booked to travel on BW 726 to JFK New York on Caricom Day Monday 2nd July 2018 through CJIA was held after she excreted cocaine pellets. At approximately 22:00hours yesterday evening she checked in her luggage and whilst on her way to the departure lounge she was intercepted by CANU Ranks who escorted her to a City hospital where suspected cocaine pellets were displayed in her digestive tract on an x-ray and as well an object inserted in her lower extremity was also observed. She was admitted as a patient and has since extracted one large object suspected to contain cocaine that was observed in her lower extremity. Regarding the ingested pellets seen in her digestive tract she has so-far excreted 3 suspected cocaine pellets and remains hospitalised. This suspect is the mother of an 11month old baby girl with whom she was travelling when she was intercepted. The baby has since been handed over to her grandmother, CANU said.